There’s no better feeling than leaving the office on a Friday with an overnight bag slung over your shoulder and a smug look on your face. Weekends away help us make it through to our holidays proper, but their limited luggage allowances have the potential to leave us puzzled. Pack too much and risk the wrath of the departures gate inspectors, pack too little and you’ll find half your holiday is spent shopping or – worse still – in the launderette. The key to the suitcase conundrum is a capsule collection, featuring a carefully curated selection of pieces that coordinate, fit the climate and, most importantly, will keep you looking cool when the temperatures start to heat up. We’ve pulled together a list of the holiday must-haves deserving of a place in your case. While we love a good graphic tee, the key to a capsule collection is pieces that are easy to wear together. Stick to the blue and white theme in this great quality striped t-shirt by Hugo Boss. We love the ethos behind Bowler & Beach swim shorts and the swallow print adds something special to this navy and white pair. Keep evenings cool and casual in a linen shirt. We love the unusual V-shaped collar on this Armani Collezioni style. Lightweight chinos in a neutral colour like cream will work well with casual tees and smarter shirts alike. The beauty of Swims loafers is that they can take you from the side of the pool to the side of the bar with more panache than a flip flop ever could. Visit us in store 7 days a week at DN1O 6JH and create your holiday capsule collection today. Since becoming an official stockist back in 2014, summer for us has equalled SWIMS. These stylish, practical, lightweight loafers are the perfect shoe for summers spent socialising and holidaying in the sun. Whether your summers are spent yachting or shopping, the Norwegian footwear brand will make sure you’re doing so in style. 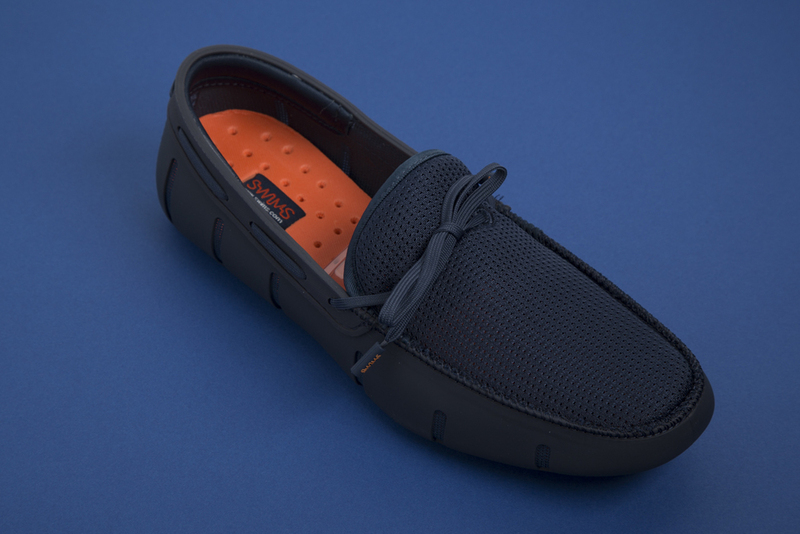 Cashmere rubber and a polished inner lining makes SWIMS as practical as they are stylish, meaning they’re the perfectly preppy alternative to flip-flops or sandals for the man who favours a more structured shoe for off-duty occasions. The only shoes we want on our feet when the weather hots up are two of SWIMS’ new season styles. 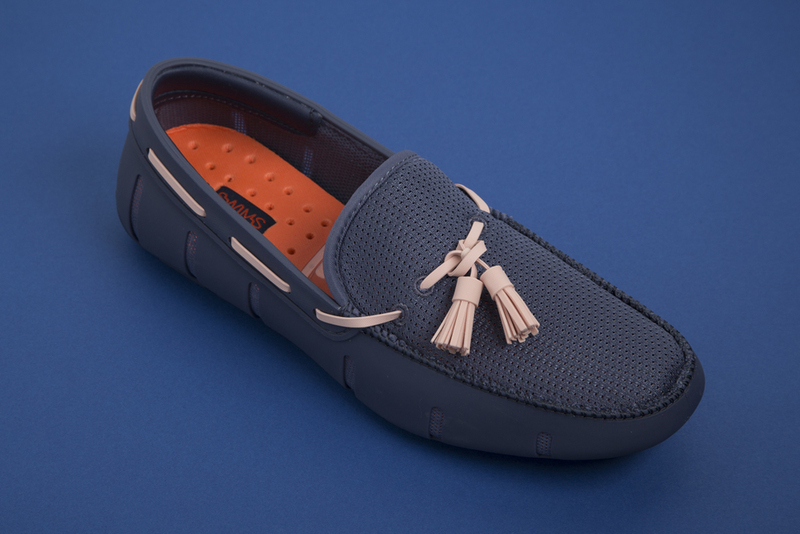 Part of the brand’s ‘lux’ collection, the Woven Lace Loafer Lux combines navy weave detail with suede and metallic accents, plus the rubber driver sole that the brand’s loyal followers love it for. If the Woven Lace Loafer Lux is reserved for nights out in Monte Carlo, the Lace Loafer in black and white will ensure you look equally as cool during your day by the beach. 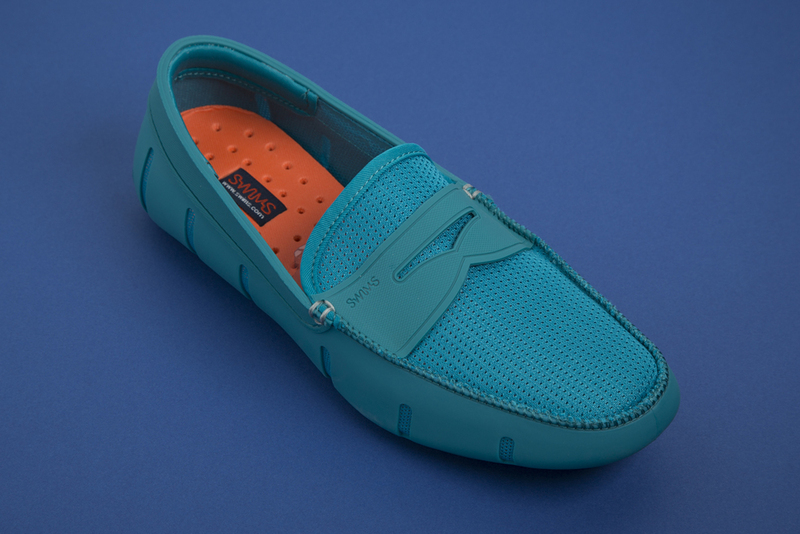 Simpler than the Lux Loafer but equally as stylish, this classic shoe incorporates everything that has made SWIMS our go-to footwear brand for the summer season. Visit Robinsons today to shop new season SWIMS and make sure your summer look is strides ahead of the competition. Summer footwear is a touchy subject; flip-flops on men divides opinion, trainers look great but just don’t work on the beach and loafers are just too warm when the weather starts to hot up. SWIMS are the answer to your summer shoe conundrum. 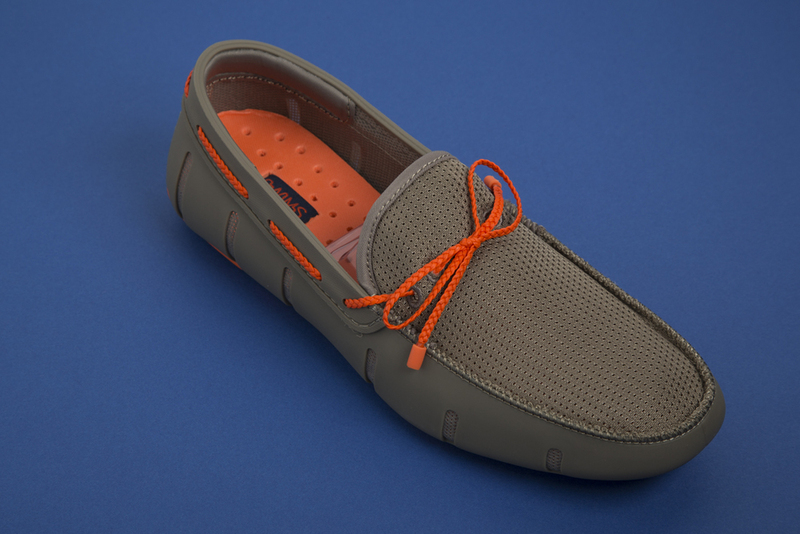 A classic style crafted from SWIMS’ signature rubber, the loafer is perfect for beach, boat and beyond. Ventilation gills keep feet cool and comfortable, whilst an anti-slip and non-marking soles will keep the lifeguards happy poolside. The loafer style will take you front beach to bar and back, blurring the line between traditional shoe and waterproof wonder. It’s the perfect combination for the hot summers we’ve been praying for in 2015. Visit us in store today to see all colours and styles in the SWIMS range. Your feet will thank you for it. The ultimate summer shoes are now being stocked at Robinsons and are proving to be the gentleman’s favourite seasonal footwear! Flying off the shelves, grab these fabulous functional footies to take you throughout the sunny spree! These classic loafers made in SWIMS signature cashmere rubber are preppy and practical slip ons that can be donned dry or worn wet. With multiple ventilation gills and a durable and flexible outer shell, the waterproof wonders are this season’s hottest buy! Browse through our selection of penny loafers that colourfully range from fused tones to solid blocks of navy, taupe and black. Focused on incorporating a touch of classic with modern flair, the luxe loafer’s are fast becoming the warm weather wardrobe’s essential must-have!